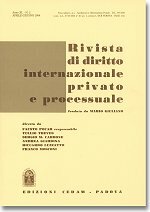 The first issue of 2013 of the Rivista di diritto internazionale privato e processuale (RDIPP, published by CEDAM) was just released. It features two articles and two comments. In her article Costanza Honorati, Professor of European Union Law at the University of Milano-Bicocca, addresses the issue of International Child Abduction and Fundamental Rights (“Sottrazione internazionale dei minori e diritti fondamentali”; in Italian). In several recent decisions on cases concerning the international abduction of minors the European Court of Human Rights set the requirement of an “in-depth examination of the entire family situation” in order to comply with Article 8 ECHR. The present article considers the effects of such principle on the role and on the proceedings of both the court of the State of the child’s habitual residence and of the court of the State of his refuge after abduction, especially when acting in the frame of Brussels II Regulation. While the requirement of «in-depth examination» seems overall synergetic to the role of the court of habitual residence, also when such court is judging on the return of the abducted minor pursuant to Article 11(8) Reg. 2201/2003, deeper concerns arise with reference to the role of the court of the State of refuge. When such a court is asked to enforce a decision for the return of the abducted child, the possible violation of the child’s fundamental right in the State of origin might raise the question of opposition to recognition and enforcement. The article thus endeavours to find a solution balancing the child’s fundamental rights and EU general finality to strengthen the area of freedom, security and justice. In their article Paolo Bertoli and Zeno Crespi Reghizzi, respectively Associate Professor at the University of Insubria and Associate Professor at University of Milan, provide an assessment of “Regulatory Measures, Standards of Treatment and the Law Applicable to Investment Disputes” (in English). The relationship between State regulatory measures and the international standards of protection for foreign investments has proved to be a critical issue in investor-State arbitration. Normally, two legal systems are involved: the legal order of the State hosting the investment is competent to govern economic activities (including those of foreign investors) carried out on its territory, and the international legal order sets forth the duties of States in respect of foreign investors. After having discussed the basis for, and the law applicable to, investment claims (both in treaty and in contract claims), this article examines the interplay between regulatory measures and the international standards of protection for foreign investments, i.e., indirect expropriation and fair and equitable treatment. The authors also analyse the influence on the arbitrator’s evaluation of the presence of a stabilization clause in the agreement between the State and the investor. The Council Directive 2010/24/EU of 16 March 2010 concerning mutual assistance for the recovery of claims relating to taxes, duties and other measures, issued under Articles 113 and 115 of the TFEU, was implemented in Italy by Legislative Decree No 149 of 14 August 2012. The Directive introduces a uniform instrument to be used for enforcement measures to recover claims in another Member State, and realizes a system of implementing decisions in tax matters typically excluded from judicial cooperation on civil matters. Directive 2010/24/EU provides that enforcement in other Member States is permitted by means of a uniform instrument which is automatically valid in the requested Member State. The automatic recognition provided for by Directive 2010/24/EU is different from the abolition of exequatur in the field of judicial cooperation in civil matters provided by, respectively, Regulation No 805/2004, Regulation No 1896/2006, Regulation No 861/2007, and Regulation No 1215/2012. Directive 2010/24/EU sets out a new instrument, named uniform instrument, which is subject to automatic recognition and it is formally distinct from the initial instrument permitting enforcement issued in the applicant Member State. This article addresses Regulation (EC) No 261/2004 in so far as it deals with delay in the carriage of passengers by air, as interpreted by the Court of Justice of the European Union in the joined cases Nelson and TUI Travel. It considers whether this recent judgment is consistent with the Montreal Convention of 1999 reaching the overall conclusion that it is not. This unsatisfactory result is due to purpose of ensuring a level of protection for passenger higher than that provided by the international uniform rules. This aim has been achieved affirming the interpretation of the Regulation provided in the Sturgeon case, in which the Court went far beyond the wording of the Regulation, and in the IATA case, in which the Court advanced an untenable and ambiguous construction of the relationship between the Montreal Convention and Regulation No 261/2004. Conversely, in deciding the joined cases, the Court neglected its duty to interpret according to the proper criteria provided by international law the treaties ratified by the EU, and failed to ensure that the EU respect its duty as contracting party. Indexes and archives of the RDIPP since its establishment (1965) are available on the website of the Department of Italian and Supranational Public Law of the University of Milan.